The popular upcoming series which originated from a perfectly executed game released a second trailer. A little background: In the midst of 1986, 18 people step foot on the remote island of Rokkenjima. Little do they know, a “spate of murders” takes place soon after. The trailer can be accessed on famitsu’s website. Umi Monogatari, or “Sea Story Fantasy” is streaming their opening sequence. a little info: “transforming magical girl action” story centers on Marin and Urin, two “pure” sisters who live alongside the fish in the sea, but yearn to be in the world beyond the water and above ground. One day, a beautiful ring falls in the middle of the sea, and Marin and Urin retrieve it. The two decide to leave their waterbound world for the first time to deliver the ring. After an arduous journey, they come across an isolated island where a high school girl named Kanon lives. 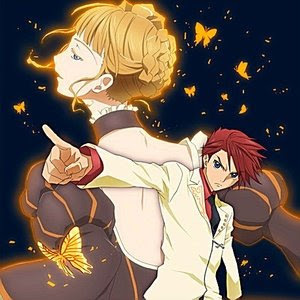 The encounter between Marin and Kanon — the maiden of the sea and the maiden of the skies — awakens a hidden power as the world is threatened by an enveloping darkness. The anime will premiere in Japan on June 24. Not quite sure about U.S. dates yet. 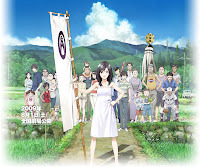 Summer Wars Trailer Finally Here! The lead characters are a couple of teenagers, a couple elderly people…and bulldozers? I have no clue what it’s about at the moment, but I am always gathering information daily. for book lovers. In an alternate world, people who pass away become books. The librarian of (all? or some?) books is to be killed by a man named Kori Tonisu. His memory is erased and a time bomb on his chest, he does the unthinkable. He falls in love…with the librarian. As of now, I am not sure when this anime will be released.